Summer is here! And so is mango season. A tropical tree fruit, the mighty mango is nicknamed the “king of fruits,” and for good reason. Not only are mangoes incredibly delicious, sweet, and aromatic fruits, they’re also insanely good for you. And on top of all that, mangoes provide a special bonus for anyone who likes to smoke weed. That’s a win-win: a healthy snack that you can eat before (and during and after) you smoke weed to make your high last longer! So what makes mangoes the perfect choice for cannabis users in search of healthy, high-enhancing snacks? Well, the answer may just blow your mind. 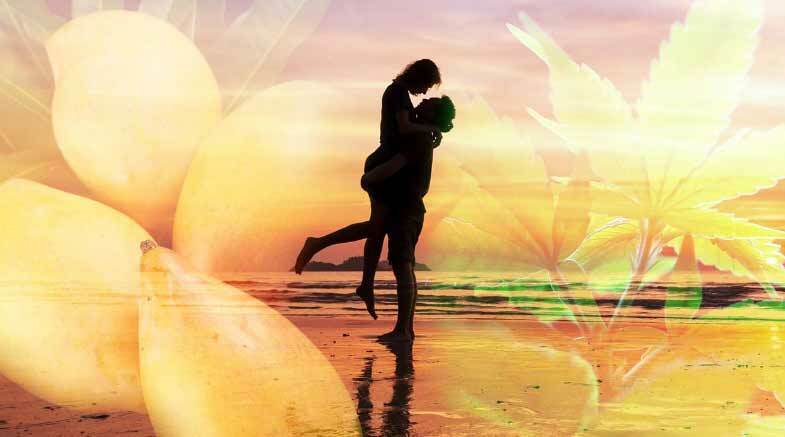 In order to understand why eating a mango before you smoke weed makes your high last longer, you need to know about the intimate relationship the fruit and the flower share. You probably know the Latin names for weed. They’re Cannabis sativa and Cannabis indica. Those two species of the cannabis plant are the dominant types people cultivate for medicinal and recreational uses. Indica and sativa are pretty different from one another, but they can be combined to form hybrid strains that combine their effects. Well, check out the Latin name for the mighty mango. It’s Mangifera Indica. Notice something? They both share a common name, which points to something they both share. In this case, that’s their geographic origin: India. Both marijuana and mangoes were originally cultivated in ancient India. Mangoes are still a staple of the Indian diet today. And because of that common origin, they both share a similar chemical fingerprint. At the chemical level, marijuana and mangoes are both loaded with the terpene Myrcene. In fact, of all the hundreds of terpenes in cannabis, Myrcene is the most common across dozens of different strains. Terpenes are the plant compounds that impart, among other things, the characteristic tastes, smells, and fragrances of a plant. You can read all about terpenes, what they do, and why they’re an important part of your cannabis experience here. The bottom line is that terpenes are powerful compounds, influencing how your body and bloodstream reacts to the weed you smoke. So here’s the details. First, let’s understand what the myrcene terpene actually does. Myrcene proliferates in the same parts of the plant where CBD and THC exist. When you smoke, those compounds enter your bloodstream through the lungs, just like oxygen. But to trigger the psychoactive effects of smoking weed, THC needs to move across the “blood-brain barrier.” Otherwise, you wouldn’t get high. But that barrier, which is a membrane, is very selective. It doesn’t allow very many chemicals through. That’s where myrcene comes in. It actually “ushers” THC and other cannabinoids across the barrier, letting them slip through more quickly and in larger numbers. And that’s the secret to why eating a mango before you smoke weed will make your high last longer. When you eat a mango first, you load up your bloodstream with the myrcene terpene. It’s ready and waiting to help some THC molecules slip into your brain. Of course, the weed you’re smoking brings some of those terpenes with it, as well. But eating a mango beforehand increases the “bioavailability” of myrcene. The result is awesome. You’ll experience your high come on quicker than usual. On top of the quicker onset of you’re high, the increased bioavailability of myrcene will also ensure that your brain receives more of the THC that’s in your bloodstream. This, therefore, also makes your high last longer. You’re simply making more efficient use of the available THC in your blood. The bottom line is simply this: eating mangoes before and during a smoke session can increase the length of your high. Mangoes have the unique property of enhancing how well your body makes use of the THC you put in it when you smoke weed. 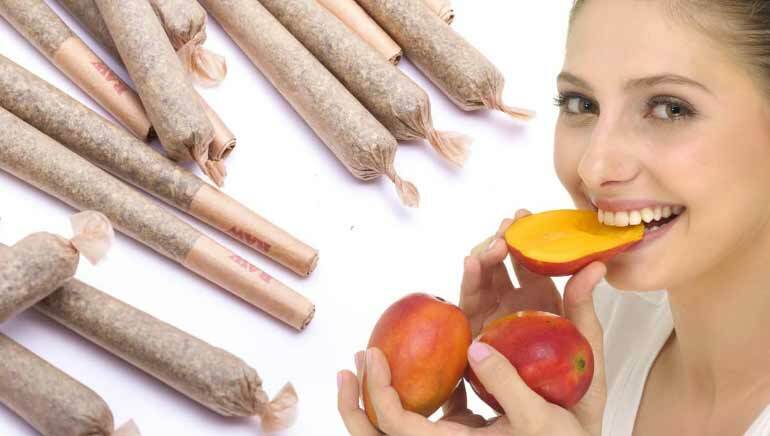 In other words, eating mangoes won’t necessarily make you more stoned, but you will be high for longer. That’s because of the perfect harmony between the terpenes in mangoes and the terpenes in cannabis. Here’s an important thing to remember, though. Make sure to eat the mango about a half hour before you smoke up, for maximum effect. Your results may vary, so experiment. Of course, the best part is, you can eat mango anytime during a smoke session, too. It’s a healthy way to stave off the munchies and it may just help your high last longer anyway. So why not eat a mango every day? You’ll enjoy the many health benefits and always be ready to make the most out of your cannabis.